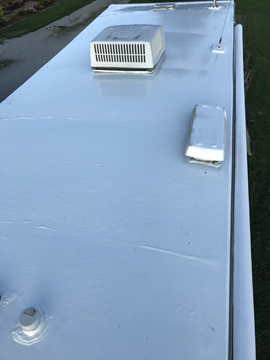 My 29, RV had a couple leaks, at the front where the aluminum and rubber roof came together under a molding, and under the radio antenna. I purchased the 5 gallon bucket. I mixed as directed, then poured mixed product into another clean bucket, scraped it clean, and mixed a few more minutes. 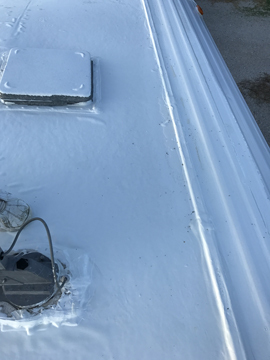 After preparation, I applied the liquid rubber around all edges and roof fixtures, I poured small amounts out of the bucket onto the roof and distributed with squeegee or roller as needed, until product was gone and the roof was well coated. I have no doubts that my leaks are eliminated. Excellent coverage. It will roll on easier than using a brush. We had 2″ of rain the following day. My troubled area was dry as I knew it would be. 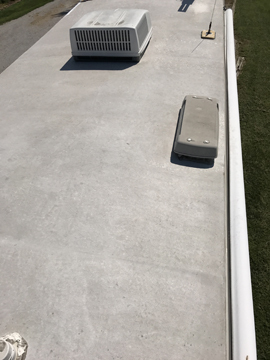 The product seems expensive, but considering the cost of a replacement roof and the problems solved, it is well worth it and adds value to your roof. One of the pictures shows the trouble area at the front, which currently has a small pool of water. No leaks! A few things to consider when using this product. It tends to string when using a brush, squeegee, paint roller, or pouring from the bucket. This is only a concern if you have vehicles parked nearby on a breezy day. The breeze will catch the fine strings and carry them to adjacent surfaces. Have a second back-up broom handle for your roller. I broke the tip off of the first one at the roller, and had to go find another. Wear shoes that can be discarded afterward. WD-40 works well to remove the rubber from skin when finished. If you mask any area, be sure to leave a tab of tape sticking up for easy removal, and do so before rubber begins to skin over. 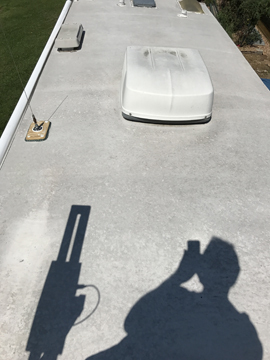 I am very pleased with the results, and will share my experience.